The Addams Family began as a series of one-panel macabre cartoons in The New Yorker by Charles Addams. However, the most well-known incarnation of The Addams Family came when a television sitcom was made in the 1960s. There, the characters received their names and many of their distinctive character traits. The series was short-lived, but the Addamses did appear in a Hanna-Barbera animated series, a musical variety show and a Halloween special in the 1970s. In the 1990s, Scott Rudin, president of production at 20th Century Fox, realized that the dormant Addams franchise was still on the minds of the populace when an impromptu sing-a-long to the sitcom’s Vic Mizzy theme broke out in a van he was in with other executives. 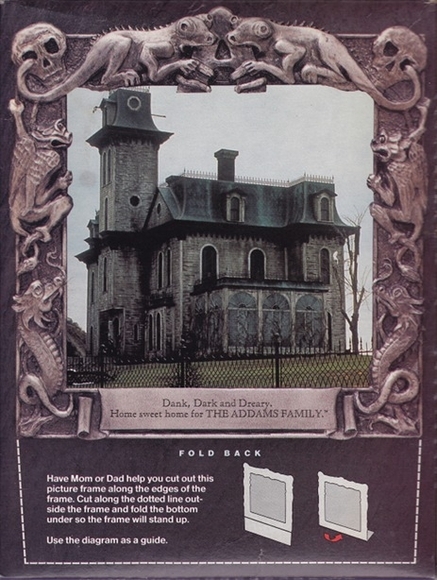 Sharing that notion with studio chiefs Barry Diller and Leonard Goldberg led to the production of The Addams Family feature film. The film ended up grossing $113 million at the box office, prompting producers to greenlight a sequel and the production of yet another animated series, again by Hanna-Barbera. One of the six portrait premiums on the back of the box. Ralston acquired the license from Paramount Pictures and made a cereal to tie into the film. The cereal was comprised of three shapes: headless dolls, creepy skulls and Thing. 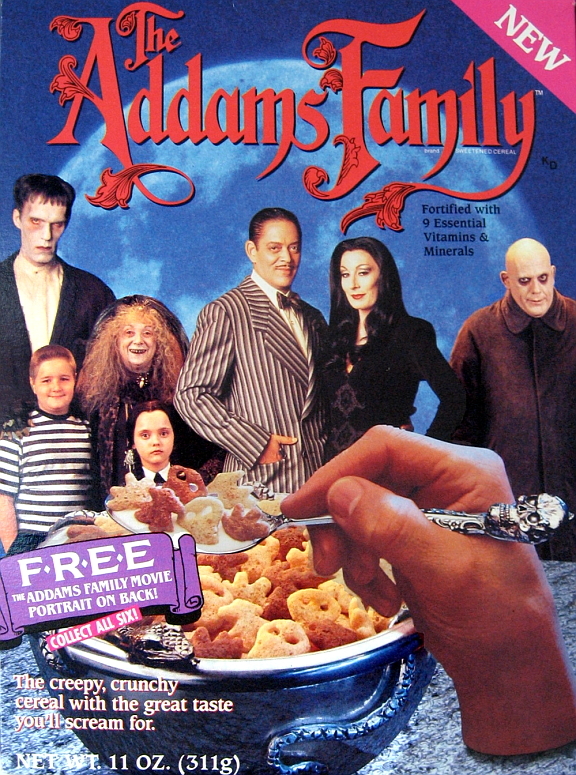 The box sent out to supermarkets to promote the cereal featured the movie cast sitting for a portrait in a gothic frame and a picture of the Addams mansion on the back. The actual box would feature the cast standing together. The only feature shared by both was Thing taking a spoon to a bowl full of the cereal. 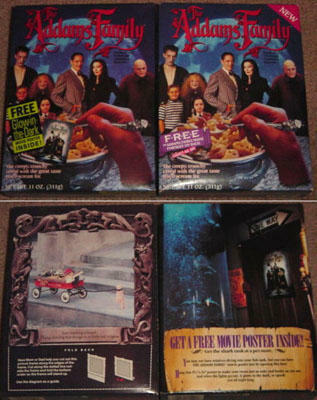 The cereal’s commercial featured Lurch (Carel Struycken) and Pugsley (Jimmy Workman), as well as Thing (Christopher Hart), from the movie with the cereal amongst various clips set to a modified version of the theme. The cereal enjoyed a nice two-year longevity on the shelves as it had the popularity of the animated series and the sequel, Addams Family Values, to keep interest in it going. Amongst the premiums for the cereal was a Thing door hanger that could be cut out of the back, glow-in-the-dark posters inside, six collectible scenes from the movie that could be cut out and displayed like a framed picture, and a card game on the back of the box. Some cereals came packaged shrink wrapped with one of four flashlights on the front in the shape of Itt, Lurch, Thing and Fester.